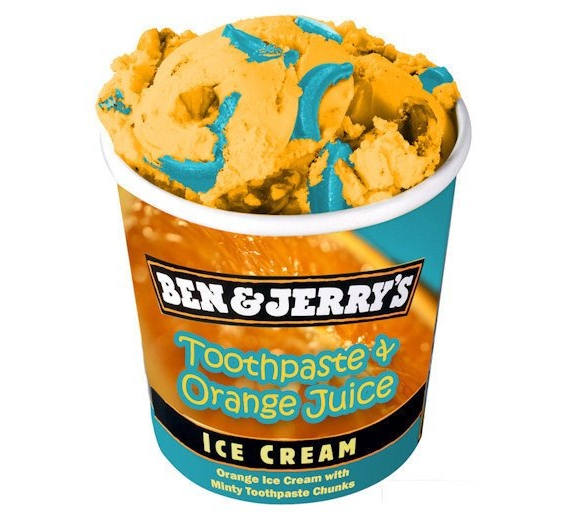 Toothpaste & Orange Juice Ice Cream? Two of my tightest homies, Ben & Jerry, are known to have come up with some seriously kooky ice cream combos in the past. But toothpaste and orange juice (aka the worst taste to ever have in your mouth) flavored? I… just can’t wrap my mind around this. Is it fake? Is it real? Is it going to leave me with a severe aversion to ice cream? Because Lord knows I’m gonna HAVE to try it. I mean, if I didn’t, I’d be going against my nature! And if there’s on thing that’s true about me, it’s that I never go against my nature can’t turn down ice cream. Even if it’s got frostbite! The worst flavour would have to be Mint ice cream with Twiglets!